Extradition is a mechanism for international cooperation among sovereign States, it consists in the procedure by which a State (the requested State) turns over to another State (the requesting State) an individual charged with a crime committed in the requesting State, for purpose of being prosecuted or punished by final sentence. Extradition is contingent upon “double incrimination” condition, namely the deed for which extradition is requested shall be considered a crime by the Italian law and the foreign law. - passive extradition or for overseas, when the Italian Authority grants it upon request from a foreign State. - it must not involve any political crimes or crimes for which the requiring foreign State applies death penalty. Passive extradition procedure consists of two phases: a jurisdictional phase and an administrative phase. The first jurisdictional phase begins with transmission of request of extradition, together with all considerably relevant documents, from one foreign State to the Italian Minister of Justice. Unless the Minister considers to immediately reject the request and unless the individual destined for extradition expressly agrees with being extradited, the Minister shall transmit the request and annexed documents to the General Prosecutor at the competent Court of Appeal of the defendant/offender's place of residence, or of the place in which the defendant/offender physically happens to be at the moment the request is submitted. Extradition cannot be granted without favourable decision of the Court of Appeal. Once the request is received, the General Prosecutor at the Court of Appeal shall summon the individual destined for extradition, mandatorily assisted by a lawyer, for purpose of identification and questioning him in regard to his eventual agreement with being extradited. The concerned individual is informed that he is assisted by a public defender, however he may also appoint a private counsel. Within three months from receipt of request, the General Prosecutor shall submit to the Registry of the Court of Appeal his own indictment. Notification of submission will be delivered to the individual destined for extradition, to his defender and to the eventual representative of the requesting Stare, they may have access to documents and lodge statements of case within 10 days from notification. Once deadline elapses, the President of the Court of Appeal schedules the hearing for judgement by decree to be notified to the other parties at least 10 days in advance, otherwise it shall be void. The hearing held in chambers, is performed without public audience. The Court of Appeal decides by a judgement delivered in chambers after obtaining information and disposing necessary verification, and after having heard the General Prosecutor, the concerned individual's defender and, if they show up, the individual for whom extradition is requested and the representative of the requesting State. 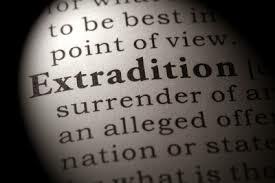 In the course of extradition procedure, it is possible that coercive measures are applied against the individual destined for extradition, as for instance preventive custody in prison or home detention. Judgement may be brought before the Supreme Court (Court of Cassation), even for the subject matter. The administrative phase of extradition procedure for overseas begins consequently to the concerned individual's acceptance, or subsequently to the judgement favourable to extradition. Within 45 days from receipt of record which contains consent to extradition, or from appeal term deadline expiry notification, or from submission of judgement by the Supreme Court, the Minister of Justice shall deliver his final decision. It is noteworthy that the Italian Minister of Justice may reject the extradition request, even if the concerned individual agreed with it or the Court of Appeal pronounced a favourable judgement. If the Minister agrees wit the request, his decision is transmitted to the requesting State, with indication of place and date of handover of the individual destined for extradition. In case the requesting State does not take over the individual on the scheduled term, the extradition granting decree loses effectiveness and the concerned party shall be set free. Do you wish to receive further information about passive and active extradition? Contact us.